I reminded him that Hudson Bay freeze-up is not truly “late” unless it is delayed until the first week in December (as it was in 1983). I won’t dispute the fact that his collared bears appear to be mostly onshore in this track map but remember these are all females with satellite collars. The behaviour of collared females, many of which may have cubs, does not necessarily represent the movements of the entire population and it is really misleading to suggest that they do. 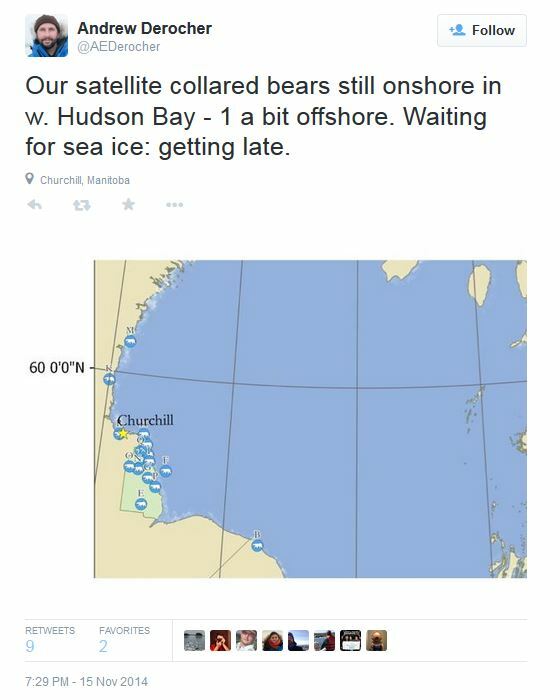 There is definitely ice present along the coast — these females are not “waiting for ice.” More misinformation. From what I can see, I would peg freezeup as November 13th this year, a couple days early but pretty much right on time. There were a couple more days of bears but mostly they were mother and cubs emerging from the willows and heading straight out on the bay. Its always a bit surprising at just how many bears sit the season out, hunkered down just inland until the last days of the season. With these families appearing, it really sums up at just what a productive season this has been for the western Hudson Bay population. Any guide who knows their stuff will tell you this was a banner year for cubs, one we haven’t seen in a long time. With this early freezeup and hopefully a later breakup next spring, this could really restore the balance to this population and quell the death knells heard in the media. Or maybe not. We’ll see. CIS ice concentration charts lag by one day, here is the one from 16 November. This entry was posted in Sea ice habitat and tagged Derocher, females with cubs, freeze-up, Hudson Bay, Kelsey Eliasson, misinformation, polar bears, PolarBearAlley, sea ice, western hudson bay. Bookmark the permalink.